Innovation, expert management, close collaboration and creative solutions to meet the needs of premium partners. As a highly desirable property in New York and New Jersey, the Hudson River waterfront is in prime position for development. Members of the AJS team were challenged to convert barren former industrial land into a viable multi-use property space for commercial, retail and public use. The team worked with local municipalities from the mouth of the river up to the Tappan Zee Bridge to raise standards up to regulatory requirements and re-envision the site as a vibrant community. 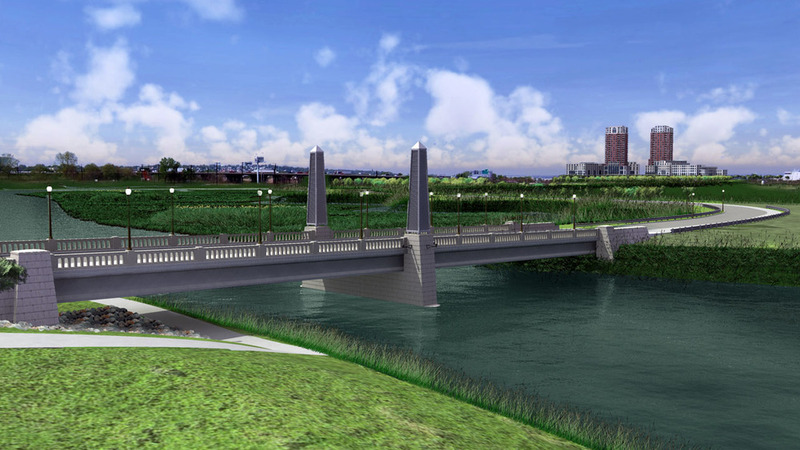 The upgrades span across waterway and rail commuting hubs, scenic walkways, greenways and mixed-use developments, which have interconnected waterfront neighborhoods and maximized the value of the land. Adaptive reuse and brownfield reclamation are among the chief methods of conserving land while incorporating sustainable redevelopment. When business magnate Steve Wynn approached members of AJS to transform a former landfill into a desirable New Jersey shore destination, the team’s methods and pioneering techniques were perfectly suited to realize his vision. The process included regulatory strategies for remediation and reuse, innovative engineering and creative architectural design. A true collaborative effort with Wynn’s team, the project resulted in the development of the Borgata and the expansion of Harrah’s hotel casino complex. Starting with an unusable piece of land, the project successfully maximized the potential of a highly profitable location and expanded the Atlantic City horizon. Still in development, the Urban Transit Study presents a unique opportunity to creatively manage a mass level project in one of New Jersey’s largest cities. The bustling community within this section of the city presents a unique challenge to preserve historically relevant design and retain the area’s rich heritage while generating a unique and dynamic community replete with neighborhood strong points such as an upgraded rail station, entertainment and retail options for area residents and commuters and upgraded housing. Challenges will include industrial constrictions, environmental standards, health and social considerations, and smooth traffic flow for an already congested area. The resulting site will include four towers (125 units plus commercial-use 30,000 RSF) with expansive views of New York City. When approached by a client invested in a failing and distressed land use project needing rescue management and post insolvency administration, the challenge is to minimize further exposure to the client, while managing litigation issues and cost factors that impair both a successful work-out and an effective exit strategy. Members of AJS have the expertise to leverage public and private interested parties to initiate rescue efforts on a failing investment. They can redefine the property's potential, while recouping loss and will protect the client's reputation, while maintaining its relative anonymity throughout the process. Currently in development, a complex brownfields program will redevelop an area along the Delaware River that will adapt and reuse existing piers and other waterfront structures into the property. AJS associates provided technical support to negotiate the remediation agreement with the site development team. Efforts included site characterization for the presence of MGP and non-MGP related wastes in soils and groundwater, identification of migration pathways and site-specific cleanup standard and delineation of on-site wetlands. The result will be an environmentally regulated construction that will maintain standards while generating a viable multi-use property with minimal cost and risk.